For most events, this is all your need. Occasionally, however, an event is hosted by multiple people, and you'd like to appoint additional co-organizers or co-hosts to the event. On other occasions, the original owner of the event can no longer attend, and they'd like to appoint somebody else to take over. Both of these scenarios are easy to manage on Stitch. Note: In both cases, the person you want to appoint needs to be either a new owner or co-organizer of the event needs to already be an attendee of the event, or member of the group. 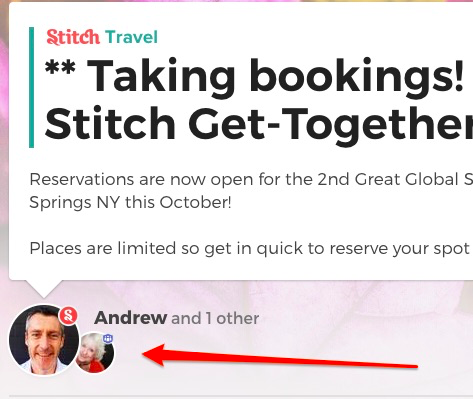 Find the list of attendees or group members near the top of the page, and select View More. This will bring up the full list of members who have joined the group or activity. 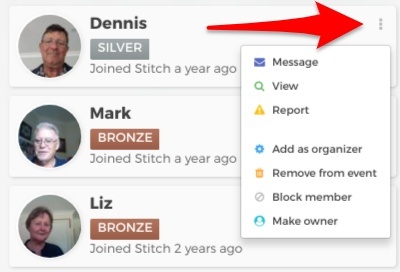 At the top of the menu are the items that are available to any member of the community: Message, View, and Report. Below this are the options that only the event or group owner will see: Add as organizer, Remove, Block Member, and Make Owner. Add as organizer appoints the selected member to be a co-organizer or co-host of the event. Their profile picture will show at the top of the event as seen in the image below, and they will also be able to block and remove members, as well as appoint additional organizers. The only thing a co-organizer can't do is to appoint a new owner; only the owner of the event can appoint a new owner. Remove from event/group/trip will remove the selected member from the event. Block member will remove that member from the event, and also prevent them from joining it again. Make owner appoints that member as the new owner of the event.